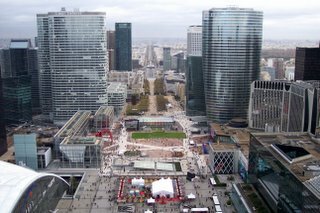 I dragged Colin over to La Défense with me this afternoon under the guise that we would get to eat bratwurst for lunch. As you may recall from yesterday, there was a giant grill at the Christmas fair that Rachel and I explored, and the smell was amazing. I've been drooling over the memory ever since, so Colin and I decided that the lack of food in our kitchen at home was a sign that we deserved to eat out. 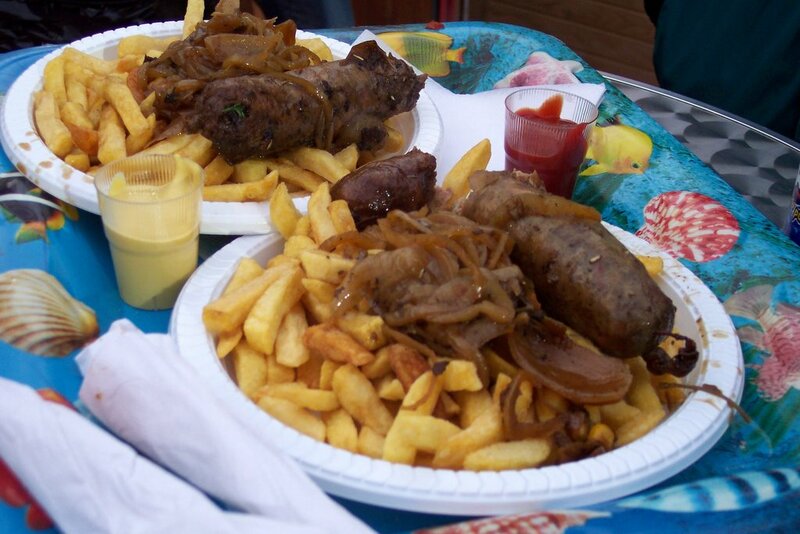 Once I finished devouring my andouillette, Colin asked me if I knew what it was. I assumed that it was just like andouille (the sausage that you put in gumbo) except that it was smaller (hence the -ette ending, like tartelette). With a mischievous gleam in his eye, Colin gleefully informed me that no, in fact, what we had eaten was a type of tripe. What does that mean, you ask? I had just eaten pig entrails. Well, you know what? It was yummy! Now, had you told me this morning that I would come home preferring tripe to the view from the top of La Grande Arche, I probably wouldn't have believed you. 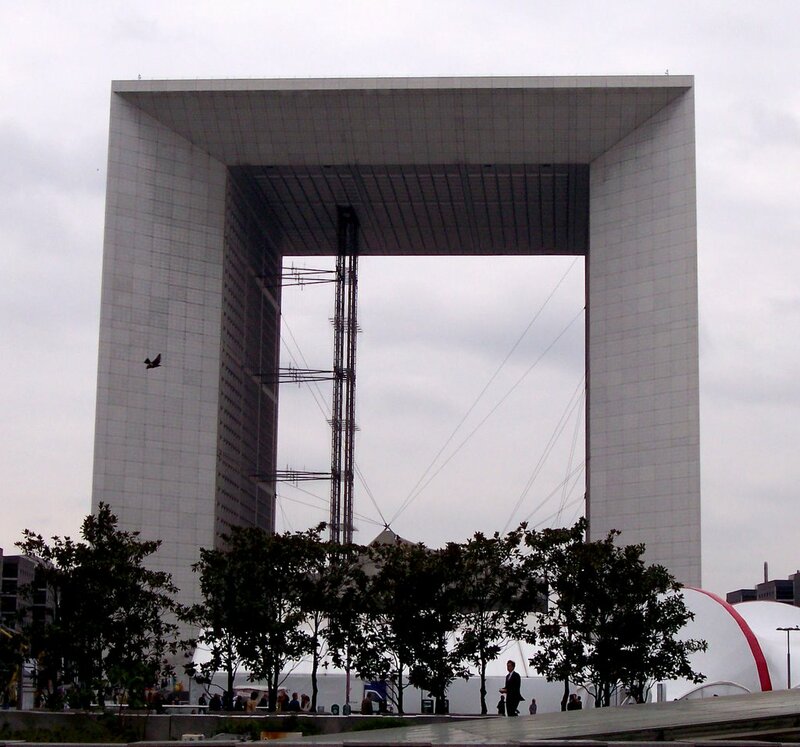 While I have recently begun to think that I'm not fond of the unoriginal squareness of La Grande Arche, I certainly wouldn't have ranked it below guts stuffed into an intestinal tube. As it turns out, the view from La Grande Arche is less than spectacular. You can't really see much of Paris because the other tall, modern buildings of La Défense are blocking the view. Further, you can't walk all the way around and see the suburbs of Paris. For 7 euros 50 a piece, I can confidently say that it's not worth your money. Here's a picture of the view, so that you can see what I'm talking about. You can also see video from the top that Colin and I shot -- I posted it to my Youtube site (the link is in the right hand bar of this blog). If you only have enough time and/or money to go up to the top of one thing, I recommend the very top of the Eiffel Tower at night. I think it's worth the extra money to go to the top, as opposed to just the second level. You can see everything and walk all the way around the circle to get every possible angle. Plus, the ticket to the top gives you access to the other two levels, so you won't miss anything by starting at the top. The other bonus of the Eiffel Tower is that they have large photos under every window that tell you which buildings are which. This is really handy if you don't know the city very well - if you see something and think, "Wow, what is that?" you can just look down at the photo and check the key. 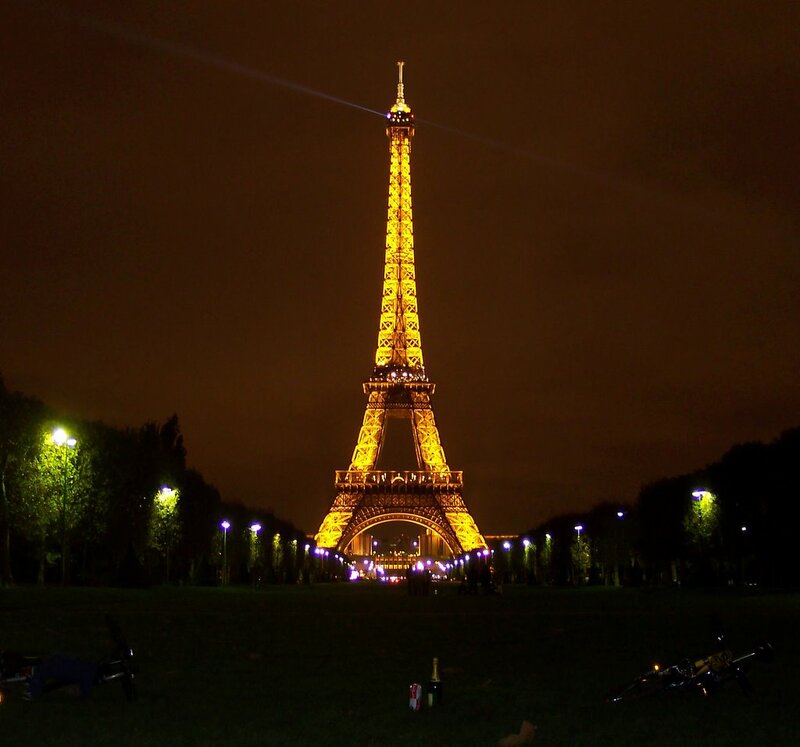 As a final bonus to the Eiffel Tower, you ride elevators the entire way, so it's much more accessible to people with any kind of physical impairments that would make climbing stairs difficult. 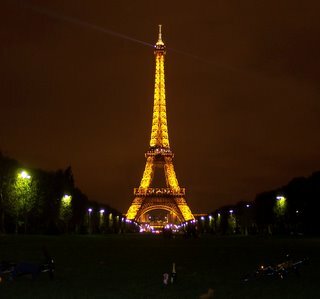 Other bonuses to going at night: fewer tourists, and the tower "sparkles" at the top of every hour by setting off strobe lights that are mounted all over it. Of course, the drawback to going up at night is that you can't get good pictures of the city without a really good camera and some professional knowledge. 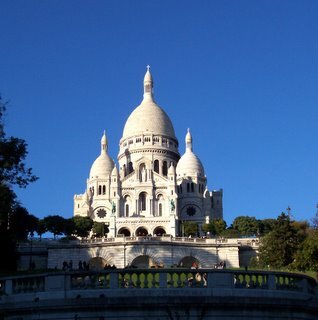 So, if you can't spend any more money and/or you have physical limitations, I recommend going to the top of Montmartre, the hill that Sacre Coeur sits on. The stair climb is free (good for the budget-conscious), and there is a funiculaire (an elevator or a tram) for people with physical limitations. The view is spectacular - you can see everything, including the Eiffel Tower, which you can't take pictures of when you're on it! 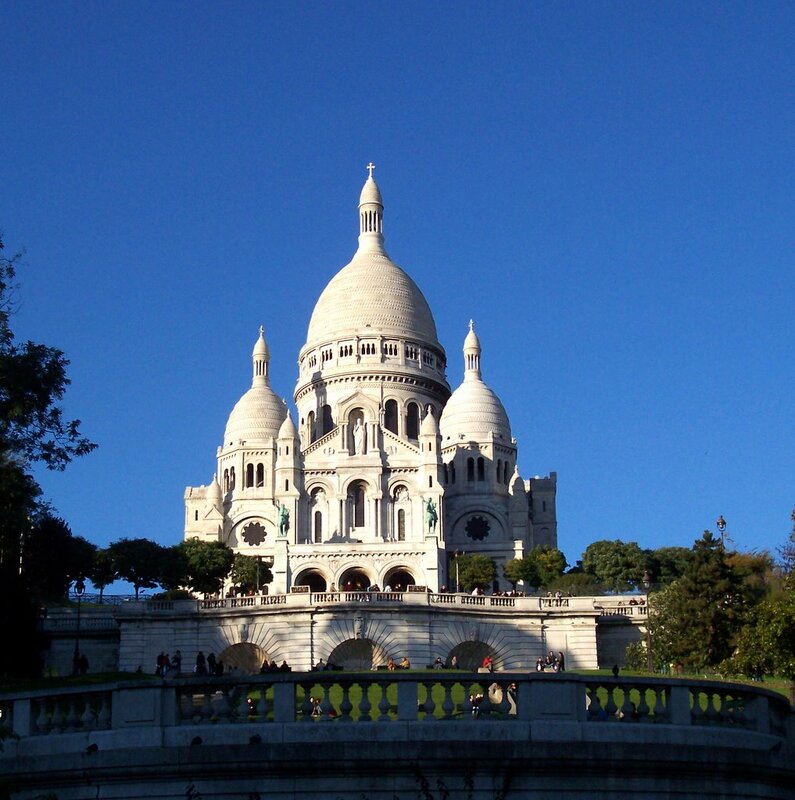 If you have extra money, you can climb the stairs to the top of the tower in Sacre Coeur. I enjoyed it immensely, but if you have limited time/money, the view from outside the church is enough. Plus, the walkway at the top of the tower is fairly narrow, so you're likely to feel crowded if there are a lot of tourists. 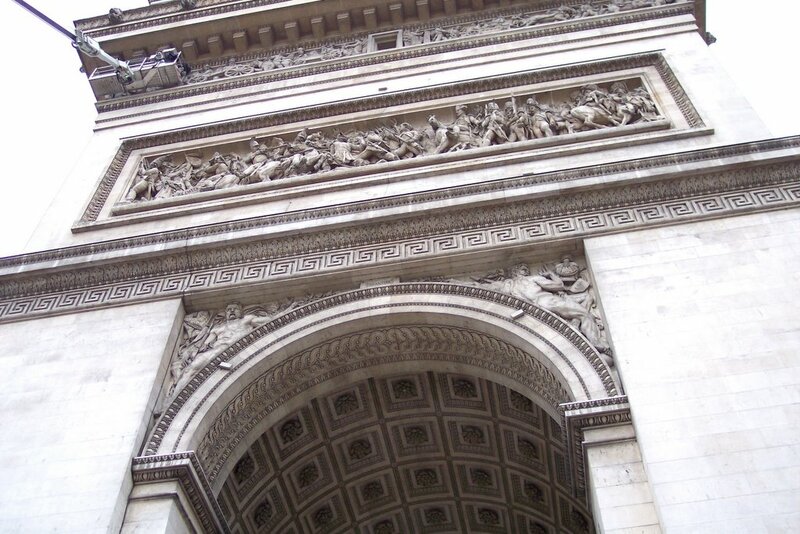 In terms of climbing stairs, I think that L'Arc de Triomphe wins the "most worth the climb" award. Unlike Sacre Coeur or even Notre Dame, there is a lot of room for people to move around on the top of L'Arc de Triomphe. 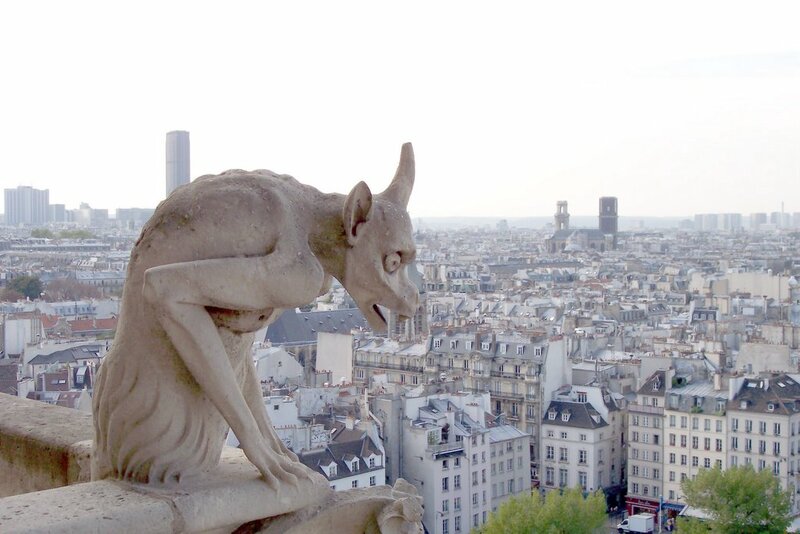 Plus, Sacre Coeur and Notre Dame don't have a map to show you which buildings are which while you're up there. 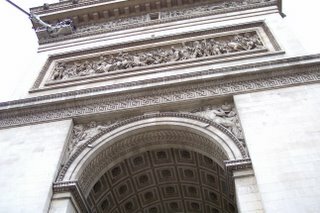 L'Arc de Triomphe has one, though it's not quite as good as the Eiffel Tower's because only two to three people can look at it at one time. Still, it's nice to have the map to know what you're seeing. By the way, I think that there is an elevator that will get you part of the way up L'Arc de Triomphe, but I can't say for sure because it wasn't working when I was there. The one drawback once you reach the top is that you still have to get up on a really tall step to get the best view. (If you have physical limitations, make sure you have someone who can help you step up, or it's not worth it. Once you get up on the step, you can walk all the way around on the top of it. You can see video of the step on my Youtube site.) OH -- don't forget that there is an underground tunnel at the easternmost end of the Champs-Elysées to get to this site! There's no need to risk your life running through eight lanes of swirling traffic. If you can't afford the 8 euro ticket or you can't physically climb L'Arc de Triomphe, you can get nearly the same impressive view from the top of Printemps Maison (the household branch of the big department store). There aren't any maps to show you what you're looking at, but you can ride escalators all the way up and stay as long as you like for free! If money, time, and physical impairments aren't an issue, I also highly recommend climbing the tower at Notre Dame for the gargoyles. The view from the very top isn't nearly as good as the ones I have already mentioned (though it beats La Grande Arche), and the walkway is really, really narrow up there. Climbing this spiral staircase is mainly worth the effort (and dizzyness) to see the gargoyles, though the view from the middle of the church is quite lovely, too. 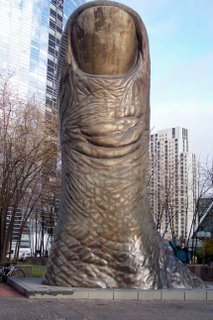 I give Paris a huge thumbs up! UPDATE: I have been to the top of La Tour Montparnasse now, and highly recommend it. Here is a link to my updated list of "The Best Climbs of Paris." so i'm expecting tripe to be some sort of french fast food chain (pronounced "treep" or something). little did i know you actually MEANT tripe! and ate it!